This book opens with a poem: “Who am I / I am the lonely soul of a waterfall / A poem / Dwelling forever in solitude / My drifting song the meandering trace of a / Dream / My only audience / The still.” It was written in 1962 when Huang Xiang was a jobless and homeless twenty-one-year-old, yet already a seasoned victim of China’s relentless political machinations. The poem exhibits an acute sense of self-knowledge and ominously foretells what would become of Huang Xiang as a person and a poet. Due to his “bad” social class, his freewheeling spirit, and his non-compliance with the dominant ideology, Huang Xiang can be seen as Exhibit A for China’s political persecution. From 1959 to 1997, Huang Xiang was incarcerated six times and spent a total of twelve years in jail. It is simply amazing that Huang Xiang would keep on writing under such harsh conditions, even as his writing brought him nothing but misfortune and suffering. Few readers could fail to be moved by Andrew Emerson’s long essay “Poet’s Life, Hero’s Life,” which offers the most complete chronicle—in any language—of Huang Xiang’s trials and tribulations, and which reads like a short version of Life and Death in Shanghai—complete with all the drama of endurance and survival that captivated Western readers of that saga. Huang Xiang comes through as a man totally possessed by poetry, and in this possession one senses the presence of a true poet who gives everything to poetry but seeks nothing in return; who wants to be heard but accepts writing in obscurity. This was, unfortunately, the condition of writing during the Mao years, of which Huang Xiang presents yet another illuminating case study for scholars and students interested in Chinese literature of the Cultural Revolution period. 1978 was a turning point for Huang Xiang. Sensing the opportunity opened up by Deng Xiaoping’s call for reforms, Huang Xiang brought a few comrades from The Enlightenment Society he co-founded in Guizhou and posted his poetry on Beijing’s Democracy Wall. Thus a legend was born in the history of contemporary Chinese poetry. 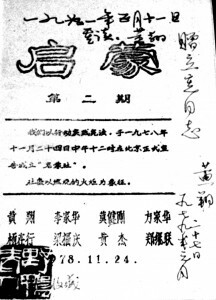 Chronologically, Huang Xiang’s journal The Enlightenment (Qimeng) preceded the more influential Today (Jintian) by a few months and his daring act of publicizing poems in big character posters and public recitals, which brought the long-suppressed underground literature to the surface for the first time, swept Beijing like a storm. These lines are every bit as dazzling and inspiring as those created almost ten years later by Bei Dao, Shu Ting and other Misty poets. It is also remarkable that Huang Xiang was able to transcend his personal misfortune and construct an impersonal voice that measures the pulse of a nation longing for openness and normalcy. In another poem “The Great Wall’s Apologia,” the poet takes the familiar cultural symbol to task and deliberates its symbolic duality—its endurance and staleness, its sheltering utility and fortress mentality, and then goes on to imagine its metaphorical demolition, bringing about China’s entry to the global village. Such profound cultural critique prefigures the popular trend of historical reevaluation in the 1980s as represented by Su Xiaokang’s influential TV documentary series River Elegy (He shang). It is quite regrettable that Huang Xiang could not have become a greater force in China’s unprecedented social and cultural transformation in the coming years because of his frequent imprisonment. 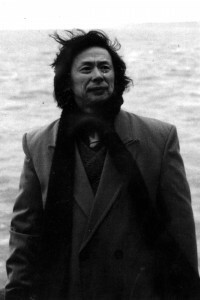 Even though Huang Xiang’s politically charged poetry represents his best work—it is likely that we will always remember him as an “overtly” political poet — the book is studded with poems on a diversity of topics, including Huang’s fond memories of childhood, his creative engagement with Chan Buddhism, and most significantly, his tender tributes to his lover, Zhang Ling (Qiuxiao Yulan). These poems not only display the soft personality behind his hard political persona but also demonstrate his versatility as a poet. The weakest part of the book is its last section, which collects poems written in Huang Xiang’s post-exile years. It is evident in these texts that the poet holds himself aloof from the unfamiliar world now providing him temporary shelter. An occasional engagement with that world produces poems such as “Animal World,” which describes New York City in a series of unprocessed and idiosyncratic images. Determined to “refus[e] exile,” Huang Xiang confines himself to a state of pure nostalgia and constructs an almost idyllic China that is in sharp contrast to the one represented in his early poems. The short poem “Freedom,” however, displays a masterful stroke in depicting an exile’s acute feeling of estrangement in the image of a transparent cell erected by the sun’s rays. In view of the continuous ban on Huang Xiang’s works by Chinese authorities, Andrew Emerson deserves a great deal of credit for keeping alive the legend of Huang Xiang. Emerson’s research on Guizhou poets remains an invaluable source for the study of underground literature outside Beijing and his translation in this book is faithful, expressive, and accurate, with particular attention paid to readability in the English language. The creative rendering of “baigu” (white bone) as “dry bone” and the special typographical arrangement in poems such as “Van Gogh” and “Isidora Duncan” showcase Emerson’s admirable ability to dance between originality and authenticity, thus minimizing the inevitable loss in poetic translation. Whatever losses that Emerson’s version might involve (which, in any case, this reviewer found to be few and far between) are made up for by the helpful design of the bilingual edition. This book doubtlessly will become an important resource for the study and teaching of dissident literature from Mao’s China. Maghiel van Crevel, Language Shattered: Contemporary Chinese Poetry and Duoduo (Leiden, The Netherlands: Research School CNWS, 1996), 62-63. 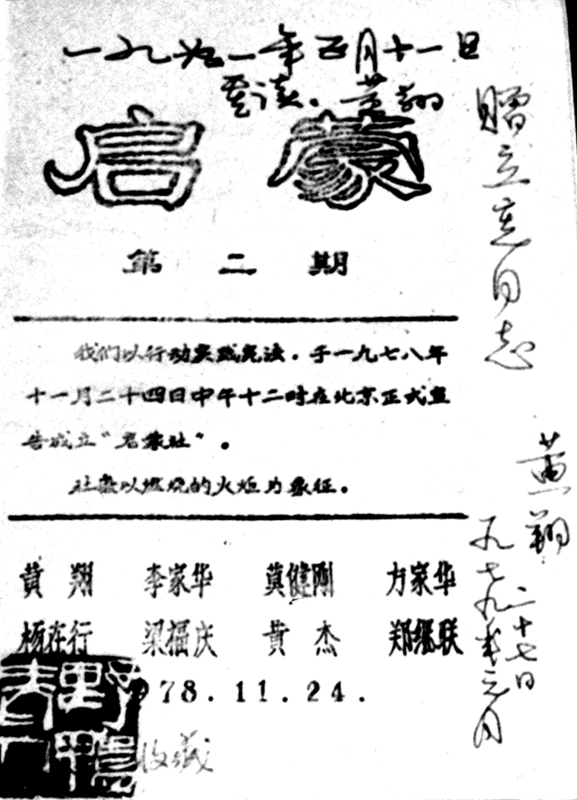 For example, see “Bei Dao fangtanlu” (An interview with Bei Dao) and “Cai Qijiao fangtanlu” (An interview with Cai Qijiao), in Liao Yiwu, ed., Chenlun de shengdian (The fallen temple) (Ulumuqi: Xinjiang qingshaonian, 1999), 327-339 and 492-496.